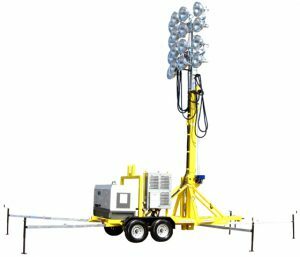 PORTABLE 80-FOOT ULTIMATE PORTABLE STADIUM LIGHT-TOWERS SIXTEEN FLOODLIGHTS will illuminate 80 acres and project light 2000′. One of these 80′ towers will take the place of 15 commercial 30′ light towers on a large project. Huge cost savings on fuel costs, labor to start-stop engines each day, labor to fuel and service 15 towers compared to only one 80′ stadium towers. 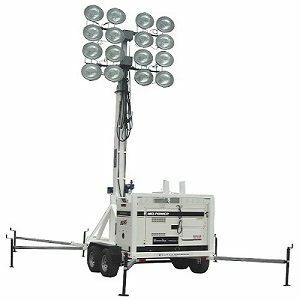 All Boss Ultimate Stadium light towers have tower safety features that include auto stop at 100′, auto boom lock prevents the tower from lowering if towering system is compromised, auto stop when lowering to nesting position prevents any back-lashing on winch drums. Boss tower have high wind speed monitoring that will auto lower tower in winds exceeding 45mph. 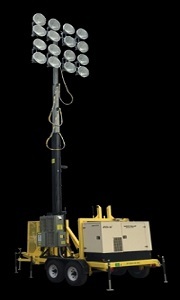 These tower fixtures can be arrange to project light 180* or reposition to produce 360*lighting depending on application requirements. The Boss electrical system has a frequency monitor that detects when diesel generator is running out of fuel and automatically shuts off power to the floodlights preventing damaging electrical voltage spikes that damage lamps and ballast systems. This is just one of the many operating safety features incorporated on Bossltg Ultimate Stadium towers.